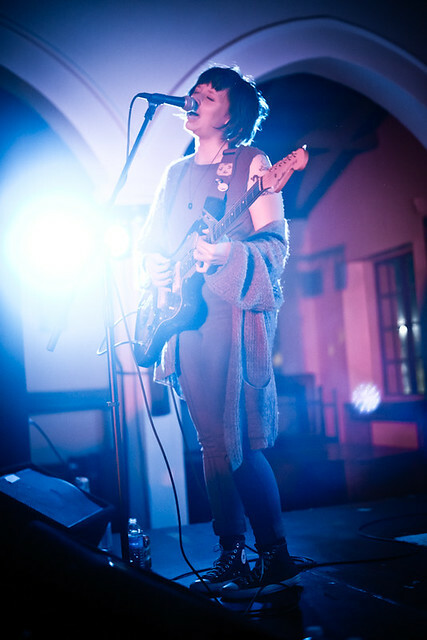 Waxahatchee performs at The Center of the Arts in Eagle Rock. But the night starting off with UPSET, made up of former Best Coast drummer Ali Koehler who trades in sticks for picks, fronting this LA outfit. 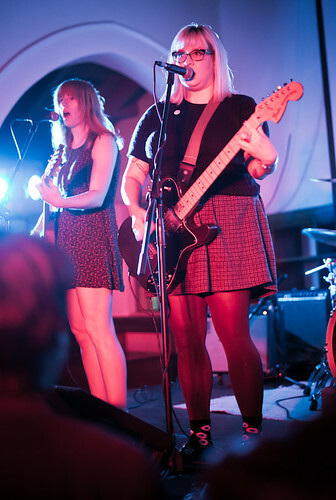 Supporting their debut album She's Gone which dropped last August via Don Giovanni Records, UPSET, along with Koehler, consists of La Sera's Katy Goodman playing bass and Jennifer Prince on guitar. Equal parts fast and heavy but also bright and colorful: perfect for those who love punk rock but love to mosh in a sun dress. 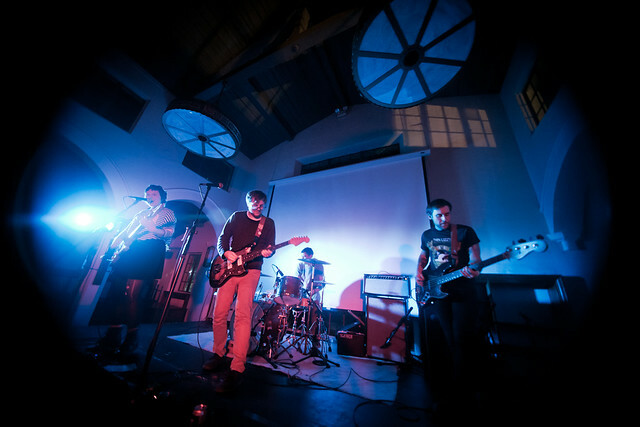 With drum heavy beats, UPSET echoes the punky-pop sounds of The Muffs with the beach-surf melodies of the Beach Boys in songs like "Let Go" and "Queen Frosteen." And with catchy songs like "Queen Frosteen" and "Don't Lose Your Dinosaur," Upset doesn't take themselves too seriously with lyrics like "Don't lose your dinosaur because there's always more where that came from" and "Queen Frosteen my enemy she's everything and I'm nobody..."
Allison Crutchfield and Kyle Gilbride of Swearin' at The Center for the Arts Eagle Rock. 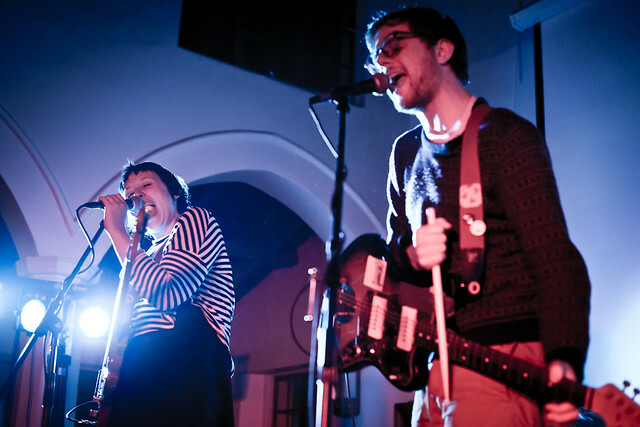 Next up was Swearin', the four-piece rock outfit based out of Philly, consists of Allison Crutchfield, Kyle Gilbride, Keith Spencer and Jeff Bolt. While others have made the comparisons to The Breeders and Pavement, for me, they remind me of The Pixies' slacker, laid back melodies that quickly bursts into explosive energy. Either way, those are great bands to be associated with and even mentioned in the same sentence with. Their songs, based off of their two LPs Swearin' and Surfing Strange are painted with scuzzy guitars highlighted with deep, throbbing drums that even had former Best Coast drummer Ali Koehler air-drumming along offstage. Of course, the highlight of the night was watching Katie Crutchfield's Waxahatchee take the stage. I missed her at this years' SXSW so I was happy when she returned to Los Angeles to play. Although at this show at Eagle Rock, about 20 minutes outside of Los Angeles, the crowd is different from the a usual LA crowd in such a way that you can expect to see tons of cell phones raised, taking pics or videos, tweeting, instagramming, etc., this crowd really seemed more focused on the music; so focused, they came out to pack the Center for the Arts in 40 degree temperatures - that's freezing for L.A. standards. 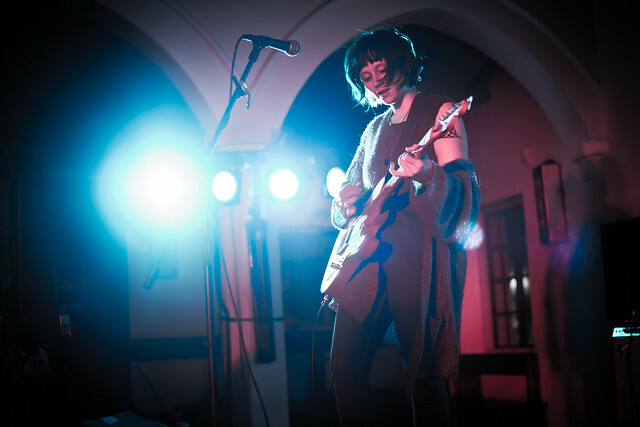 Often times they did seem too focused, like a study hall in a library as it was so quiet between songs that Katie, drummer Keith Spencer and bassist Katherine Simonetti giggled and hushed each between songs. But maybe that's because Katie's songs border melancholy-folk and pop which bleeds emotional and a deep vulnerability that she shines in its simplicity leaving the crowd awestruck in her powerful and meaningful tunes. The venue, also not your typical LA venue, preferring simple red lights as opposed to flashy, colorful light show that flash and blink to the point of near epileptic seizure attack. The Center of the Arts know that the music is the main focus and that's how they like to showcase their shows. Which is why, this night, Waxahatchee's songs seemed hauntingly beautiful under the darkened lights, awash in sunset reds as though the crowd huddled quietly around her for the glow of her passionate and warming melodies. 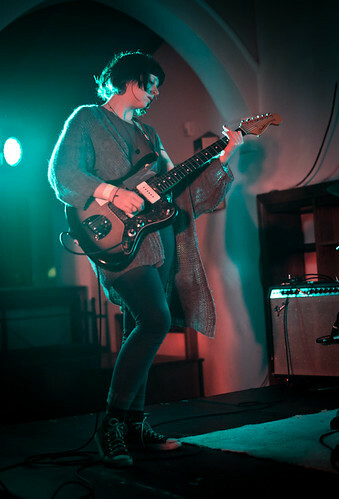 Waxahatchee performed songs from both Cerulean Salt and American Weekend, her critically acclaimed 2012 LP. Her most recent, Cerulean Salt, was released last March which landed on many Top 10 and Best Album of the Year lists.